As soon as the welcome campaign is over, the next action starts in the DT Spare Parts Premium Shop. For the Christmas season, the brand DT Spare Parts has considered a special thank you for loyal workshop professionals. 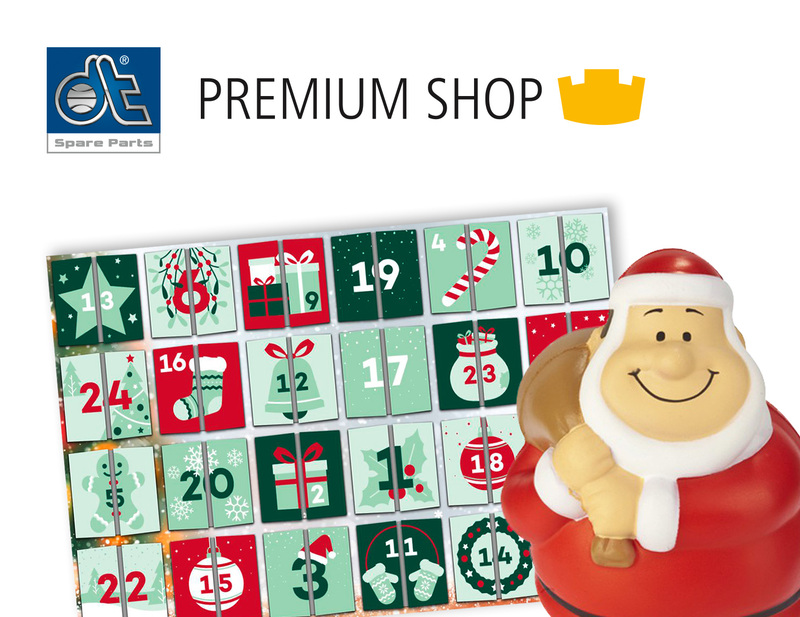 It’s worth it to visit premiumshop.dt-spareparts.com every day, because there are many great surprises in the online advent calendar. 24 doors each are hiding something new: From 1 to 24 December 2018 Premium Shop users have the opportunity to order, for example, premiums at a reduced crown price and therefore get valuable rewards. What else hides behind the doors of the online advent calendar has to be find out. Even the welcome action was very well received. From August to November 2018 new participants had the chance to win a total of 3 000 000 crowns worth a total of € 20 000. Many workshop customers took the opportunity to sign up for the DT Spare Parts Premium Shop to automatically join the campaign. Every month, ten winners have been selected who have already received some valuable rewards for their won crowns. The Premium Shop works as follows: By purchasing products of the brand DT Spare Parts from one of the Diesel Technic distribution partners, workshop customers will receive crown codes, which are printed on the article label of the packaging. They’re easy to spot: they are printed on a yellow background next to a crown. Behind each crown code there is an amount of crowns. Workshop customers enter the crown code in the Premium Shop at premiumshop.dt-spareparts.com after the free registration. Afterwards, this amount of crowns is credited to the customer’s account. The more products are purchased, the more crowns are collected – their credit increases. To not miss a day and a surprise in the online advent calendar, workshop professionals should sign up for free immediately at premiumshop.dt-spareparts.com. Each door is opened only one day at a time. It's worth it to be fast!